The city´s "green lung", where nature takes a breath in the midst of bustling modernity. In early 19th. century it remained a barren area, wasted by constant floods of the Río de la Plata; until, in 1834, Juan Manuel de Rosas, Buenos Aires´s Mayor, had the land filled and his country house built on this spot. During the 1870´s decade, the growth of the aristocratic neighbourhood caused president Domingo Sarmiento to order the recovery of the 540 hectares in an effort to supply this lovely residential area, with a beautiful scenery. 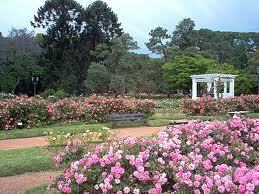 Nevertheless, it owes its actual aspect to landscape architect Carlos Thays, who, in late 19th. 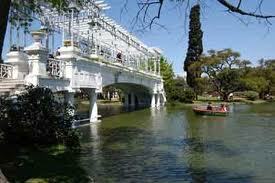 century, enlarged the areas towards the river bank and Recoleta. Some time later, the Rosedal was built, a huge area equipped with 1000 rose bushes and several other attractive spots, such as the Patio Andaluz, the Glorieta, the Puente Blanco and the Jardín de los Poetas. Added to this, at the Tres de Febrero Park stand important centres for social and sporting activities, such as the Palermo Racetrack, the Campo Argentino de Polo, the Planetario Galileo Galilei and the Campo Municipal de Golf. - Palermo Racetrack: Attend the Gran Premio Nacional, it´s a unique spectacle. Del Libertador Ave. 4101. 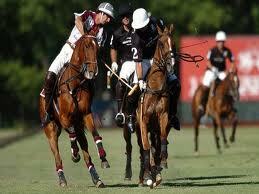 - Campo Argentino de Polo: In November the Abierto Argentino de Polo is held. 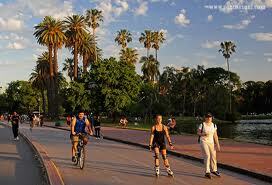 Del Libertador Ave. and Dorrego Ave.
- Campo de Golf: It´s 18 holes have been played by De Vicenzo and Romero. E. Tornquist 6397. - Planetario: Within its walls astronomical shows are hosted. Sarmiento Ave. and F. Alcorta Ave.